Powers/Abilities: Devil-Slayer has no known superhuman abilities though he is part of the line of Devil-Slayers. He wields the Sword of Naram-Sin and the wears the traditional Devil-Slayer uniform Shemagh. He wears a standard military uniform under the Shemagh. Though he has no magic powers he owns a hard drive filled with knowledge about supernatural threats. Before taking on the responsibility of being the Devil-Slayer Danny was a soldier with vast military training and experience in battlefield situations. He was proficient with handguns and automatic rifles including the M16, which he kept using as Devil-Slayer, and MK19-3 40mm, which could fire ten grenades in five seconds. (Dead of Night featuring Devil-Slayer#1 (fb) - BTS) - At some point Danny Sylva got engaged to his High School girlfriend Maria. Even though College Football scouts were fighting over him, Danny enlisted with the US Army. After his second tour in Iraq Danny had problems finding a job despite his qualifications, was left by his fiancée Maria and had a hard time to find counseling. He soon got into trouble for public drunkenness, disorderly conduct and aggravated assault. He was lucky and got off with a fine. (Dead of Night featuring Devil-Slayer#1) - Sgt. Danny Sylva returned on a Sunair plane for his third tour in Iraq after hearing about soldiers dying there everyday on the news. He listened to music on his iPod until the plane landed. He introduced himself to fellow soldier PVC Miles Ochse, who, like Sylva, had been assigned to the Quick Reaction Force. Danny welcomed Miles to Baghdad before an Army Jeep took them to the Q.R.F. barracks inside the Green Zone. Entering the barracks Sylva introduced the rest of the squad to Miles. Demarkus walked with Danny and wanted to know why he had re-enlisted. Danny told him that not everything went as planned back home and that Maria had left him. Demarkus then told Danny where everyone else had gone. Hill had left a few weeks after Danny. Bunn got axed after failing another piss test. Oliveri got brain damage from an improvised explosive device. Wahl got captured by an unknown party, but not even the defense contractors Bloodstone could find him. Danny then had a talk with Lt. Buckler, who was as surprised as Demarkus that Sylva had re-enlisted. He had done some research and knew about Danny's problems back home and wanted to know what had happened. They discussed how nobody back home cared for the soldiers in Iraq anymore and even politicians were against the war, but for Buckler and Sylva the lives of their fellow soldiers were still important. More soldiers were coming, but also private contractors like Bloodstone. Buckler warned Sylva to watch his back around Bloodstone because they were not answering to anyone. That night Danny had a hard time sleeping and looked at a picture of Maria. That night the Q.R.F. received an anonymous tip about PFC William Wahl's whereabouts (the reader saw it was Isaac Kaufmann, who sat two seats away from Sylva on the plane earlier). 30 minutes later Sylva was sent out with the Q.R.F. to an abandoned slaughterhouse where unknown parties supposedly held Wahl. Arriving at the slaughterhouse they found Bloodstone were present as well. Sylva told Lopez and Hasseron to stay with their vehicles while the rest entered the building. Inside the Q.R.F was surprised by snipers on the rafters. They killed everyone but Sylva, who made a run for a wooden door he kicked in only to find Wahl and other soldiers hung from the ceiling on hooks. They were surrounded by demons and members of Bloodstone and their throats were cut. (Dead of Night featuring Devil-Slayer#2) - Sylva told the mercenaries and demons to get on their knees, but when they ignored his order he opened fire on them. Annoyed, but not injured, the demons got back to their feet and it became clear all the mercenaries of Bloodstone were demons as well. Sylva ran back to the jeeps and called Nasser and Ramos, but when he arrived at the vehicles they were dead as well. Sylva took an MK19-3 from the back of the jeep and fired 40mm grenades at the demons, blowing them up. Sylva returned into the slaughterhouse to get Wahl off the hook. The fire he caused was spreading and Bloodstone's demonic leader Belathauzer stepped through it to go after Sylva again. He told Sylva he would take his time killing him if he didn't have a meeting the next night in Al-Qurna. The Magi Kaufmann appeared and used a binding spell to trap Belathauzer, who ripped open Kaufmann's belly before he could get away from him. Though Sylva didn't want to leave his men behind at first Kaufmann convinced him he had to if he wanted to avenge them. Kaufmann asked Sylva to take him back home, but Sylva wanted answers first. He was sure Kaufmann wasn't a reporter, but Kaufmann, who knew Danny's name, assured him he was there to help him. Via Kaufmann's radio, which was monitoring secure channels, Danny learned that Bloodstone were blaming him for the deaths of the soldiers. Back at Kaufmann's place his assistant Gabir took care of him while Kaufmann explained the situation to Sylva. Their enemies were demons led by Belathauzer and angels, who tried to cause Armageddon early. The Sword of Naram-Sin was the only thing capable of killing Belathauzer and Danny was the on to wield it as the Devil-Slayer, a title his great-uncle held before him. Sylva wasn't happy Kaufmann had been spying on him, but he wasn't interested to avenge his men. Kaufmann died of his wound and Gabir took Sylva to a cave protected by seals only Devil-Slayers, Magi and their servants could pass. Inside the cave where the Sword of Naram-Sin and the Shemagh, the Devil's Slayer's uniform. While leaving the cave Gabir revealed to Sylva, who had put on the Devil-Slayer uniform, that he knew Danny was the Devil-Slayer as soon as he had been able to enter the cave because if not he would've been killed by the wards. Outside they walked into a trap set up by Belathauzer when ghouls rose from the ground. (Dead of Night featuring Devil-Slayer#3) - Devil-Slayer cut and shot his way through the ghouls and even saved Gabir's life. Though one of the ghouls bit him it couldn't bite through Sylva's boot. Sylva and Gabir arrived before 7 AM at Gabir's place where Gabir revealed to Devil-Slayer that each generation had three Magi and one Devil-Slayer, but all three Magi were dead now. Two slain by Belathauzer and one by Sylva's great-uncle. When Bloodstone arrived Gabir told Sylva to flee because he was the only one able to stop Belathauzer's Operation: Xenogenesis. Gabir gave Kaufmann's hard drive to Sylva before he escaped the building through a hidden panel in the basement. The passage behind the panel led Sylva behind Bloodstone's roadblock. From a distance he saw Gabir's building blow up. Walking through a market Sylva bought a disposable, pre-activated cellphone and called Lt. Buckler to tell him that Bloodstone had framed him. Though Buckler believed him he couldn't do anything for Sylva because the higher ups wanted to see Sylva taken down. Sylva hung up, gave the phone a begging child and remembered Belathauzer telling him about a meeting in Al-Qurna. He stole a taxi, putting the driver in the trunk, and drove to Al-Qurna. That night Sylva used a listening device and spyglass to eavesdrop on the meeting between the demon Belathauzer and the archangel Gabriel. A demon swooped in from the sky and took Sylva to Belathauzer and Gabriel. (Dead of Night featuring Devil-Slayer#4) - Belathauzer introduced Gabriel to the last Devil-Slayer Danny Sylva. Belathauzer picked Sylva up by the throat and revealed Sylva had exactly done what Belathauzer wanted from him by delivering the Sword of Naram-Sin to them. Sylva spit in Belathauzer's face and escaped the demon's grip. He picked up the sword and was surrounded by demons, but Belathauzer told them to continue with the ritual while he took care of Sylva. Belathauzer transformed into his true form and tossed Sylva around like a rag doll. When Sylva seemed finished Belathauzer told him to watch Gabriel and the demons finished the Xenogenesis ritual. Belathauzer rammed a finger into Sylva's chest, but the Devil-Slayer managed to sweep the demon's leg and get to his rifle. Sylva shot off Belathauzer's left hand then continued to empty the gun into the demon. While Belathauzer healed from his wounds Sylva picked up the Sword of Naram-Sin and when Belathauzer leapt at him Sylva decapitated him with the sword. The other demons attacked him when they saw their leader had been killed by Sylva, but the Devil-Slayer took them all down. He took the stairs up to Gabriel and decapitated him as well. Gabriel fell into the Hell portal he had opened with the ritual and it closed behind him. Devil-Slayer stopped the Xenogenesis. After tending to his wounds Sylva returned to the Q.R.F base to clear his name, but had to run. He barely escaped without injuring anybody. Even Buckler now believed Danny was his enemy. Realizing he had lost everything and even his country wanting him dead Sylva paid a smuggler to get him to Jordan. In a hotel room in Amman Sylva examined Kaufmann's hard drive and learned that churches, corporate board rooms (including Roxxon & Kronas) and the highest offices had been infiltrated by devils. 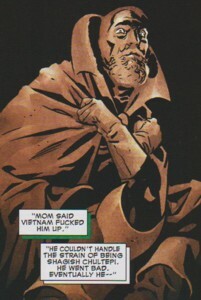 He also learned about other threats like the vampire Dracula, a Romanian businessman, and the Antichrist Hellstrom. Devil-Slayer was ready to take them down. Comments: Created by Brian Keene (writer) & Chris Samnee (artist). Those Magi sure liked invoking demons while going up against other demons! For some reason before rereading the title I was pretty sure Isaac Kaufmann was actually Isaac Christians. Dead of Night featuring Devil-Slayer was a MAX title meant for the more mature audience with a lot of gore and adult themes. It was one of three Dead of Night horror titles published under the MAX label. The others were minis featuring Man-Thing and Werewolf by Night. Aztek Bloodstone of Earth-22791, twin sister of Maya, daughter of Elsa @ Marvel Universe Millennial Visions 2001 - "Bloodstone: Have You Met My Sister"
Maya Bloodstone of Earth-22791, twin sister of Aztek, daughter of Elsa @ Marvel Universe Millennial Visions 2001 - "Bloodstone: Have You Met My Sister"
Belathauzer was the Arch-Lord of the Ninth Circle of Hell. He possessed superhuman strength, could regenerate within seconds from any injuries inflicted upon him through physical or mystical attack, shapeshift into human form at any time and increase the power of other demons. He was very proficient in ritualistic sacrifices and presumably possessed vast mystical powers. He could only be killed by the Sword of Naram-Sin. (Dead of Night featuring Devil-Slayer#3 (fb) - BTS) - A long time ago before the creation of man the likes of Gabriel and Belathauzer walked in the Garden of Eden. Belathauzer joined Lucifer's rebellion and he was cast out of Heaven. (Dead of Night featuring Devil-Slayer#2 (fb) ) - Belathauzer was the leader of a cadre of minor demons working with angels behind the backs of Satan and God to manufacture a war between Heaven and Hell. Belathauzer and his followers infiltrated defense contractor Bloodstone and used ritual sacrifices to gather energy from human souls in war zones including Darfur, Myanmar and Iraq. They were going to use the energy to unleash the forces of Hell upon Earth through Xenogenesis, the rebirth of the demon race on Earth, to trick Heaven into believing Hell had invaded Earth, which would cause Heaven to retaliate and ultimately cause Armageddon. (Dead of Night featuring Devil-Slayer#3 (fb) ) - Belathauzer decapitated a Magi a year earlier in Gaza. (Dead of Night featuring Devil-Slayer#2 (fb) - BTS) - Belathauzer came ever closer to succeeding when Bloodstone came to Iraq. (Dead of Night featuring Devil-Slayer#1 (fb) - BTS) - The military hired Belathauzer's Bloodstone mercenaries to search for missing soldier William Wahl in Iraq. The military was unaware the mercenaries were keeping Wahl at an abandoned slaughterhouse along with others they wanted to sacrifice. (Dead of Night featuring Devil-Slayer#1) - Danny Sylva walked in to the room at the slaughterhouse where Belathauzer had just cut the throat of Wahl. On the ground was a pentagram written in blood, demons were eating human remains and bodies were hanging from the ceiling on hooks. Belathauzer told Danny he was free to scream. (Dead of Night featuring Devil-Slayer#2) - Belathauzer mocked Sylva when he told everyone to get on their knees. Sylva opened fire on Belathauzer and the other demons when they didn't follow his order, but the demons just regenerated from the wounds and went after Sylva, who ran back to his jeep and picked up an MK19-3. He fired grenades at Belathauzer and the other demons chasing him and returned to the slaughterhouse to get Wahl down from the ceiling, but Belathauzer was already back on his feet and followed him into the burning slaughterhouse. He mocked Sylva again because he didn't have what it took to kill Belathauzer and then told him he would take his time torturing Sylva if it weren't for a meeting in Al-Qurna. Magi Kaufmann appeared and Belathauzer ripped open his belly with his claws. Kaufmann managed to cast a binding spell to at least temporarily trap Belathauzer. Kaufmann then fled the slaughterhouse with Sylva. (Dead of Night featuring Devil-Slayer#2 - BTS) - Belathauzer put the word out that Sylva had fired upon his own men and slew them at the slaughterhouse. Meanwhile Kaufmann revealed Belathauzer's plan, his name and his only weakness, the Sword of Naram-Sin, to Danny Sylva, the new Devil-Slayer. Kaufmann told him Sylva had to slay Belathauzer before he succeeded to cause Xenogenesis. After Kaufmann's death Gabir led Sylva to the Sword of Naram-Sin, which was exactly what Belathauzer had planned. He set up a trap outside the cave with a horde of ghouls, who had Gabir and Sylva surrounded as soon as they left the cave. (Dead of Night featuring Devil-Slayer#3 - BTS) - Sylva slew the ghouls and returned home with Gabir. Belathauzer sent Bloodstone to retrieve Sylva, but Gabir blew them up and Sylva escaped and headed for Al-Qurna when he remembered Belathauzer talking about a meeting there. (Dead of Night featuring Devil-Slayer#3) - That night Belathauzer met with Gabriel at the legendary location of the Garden of Eden, a location chosen by Gabriel because he felt nostalgic. Gabriel was late and Belathauzer was critical of the location because it wasn't even the real garden and the angel being late. Belathauzer provoked Gabriel by comparing him to a fallen angel for working against God, but Gabriel assured him he was doing everything for the good of all creation because he was sure Heaven would triumph in the war against Hell. He promised Belathauzer and his followers a place in Heaven after the war. Belathauzer told Gabriel they were ready to open the portal to Hell now, that the last Magi was killed by him before he could train the Devil-Slayer and that he knew that to be true because he had tested the Devil-Slayer with ghouls. Though Gabriel didn't like Belathauzer taking action without being consulted Belathauzer assured the angel everything was going according to plan and they had to do something about the Sword of Naram-Sin, which they couldn't retrieve themselves due to the protective wards at the cave. He reminded Gabriel how he had agreed to the plan and knew Sylva would bring the sword to them soon. Moments later a demon dropped Sylva in front of Belathauzer and Gabriel with the Sword of Naram-Sin. (Dead of Night featuring Devil-Slayer#4) - Belathauzer introduced Gabriel to Danny Sylva, the last Devil-Slayer. He was sad he couldn't offer Gabriel to kill him. Belathauzer picked Danny up by the throat before Sylva could get his hands on the Sword of Naram-Sin again. Gabriel reminded Belathauzer they didn't have time for this, but Belathauzer didn't agree. Danny spit in Belathauzer's face, then smashed his knee between his legs to free himself from the demon's grip. Sylva picked up the sword to face off with the other demons, but Belathauzer ordered them to go with Gabriel to continue the Xenogenesis ritual while he took care of Sylva. Belathauzer transformed back to his true form to fight Sylva and tossed him against a tree. Sylva dropped the Sword of Naram-Sin again and Belathauzer thanked him for bringing it. Belathauzer revealed how the sword had also killed some of Gabriel's kind in the past. Belathauzer revealed to Sylva how Gabriel used the sacrificed souls' energy to open a rift between Earth and Hell. He mocked Angels because they were forbidden to kill humans without God's orders, but Belathauzer had no problem with killing Sylva while Xenogenesis happened. He pushed his finger into Sylva's chest and told him how he would remove the spell on the Sword of Naram-Sin after doomsday and use it to kill Satan and become ruler of everything. Sylva swept away Belathauzer's leg, picked up his automatic rifle and shot off Belathauzer's arm, then shot his body to pieces. While Belathauzer regenerated Sylva picked up the Sword of Naram-Sin and when the regenerated demon jumped at him Sylva decapitated him. Belathauzer promised they would meet again before his body deteriorated. After Belathauzer's destruction Sylva prevented Xenogenesis and even slew Gabriel. 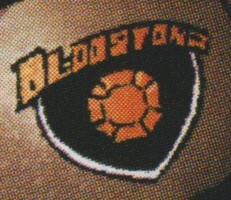 Bloodstone were the world's biggest defense contractor. They were secretly infiltrated by demons to perform ritual sacrifices in wartorn countries. (Dead of Night featuring Devil-Slayer#2 (fb) ) - Demons under the leadership of Belathauzer posed as humans and infiltrated the ranks of Earth's leading defense contractor Bloodstone. Belonging to a conspiracy of angels and demons to manufacture a war between Heaven and Earth by using Xenogenesis, the rebirth of the demon race on Earth, as a starting point they used ritual sacrifices to gather energy from human souls to cause Xenogenesis. They hid their atrocities by conducting their operations in war zones like Darfur, Myanmar and Iraq. They knew unleashing the forces of Hell on Earth would provoke Heaven to retaliate, which would result in Armageddon. Moving their operation to Iraq they got close to succeeding. 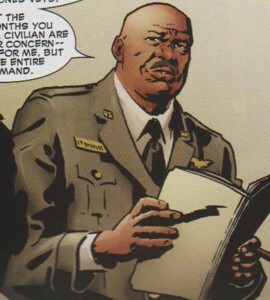 (Dead of Night featuring Devil-Slayer#1 (fb) - BTS) - Defense contractor Bloodstone got active in Iraq. They were paid to look for captured Private First Class William Wahl, but claimed they couldn't find him. 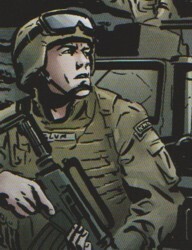 (Dead of Night featuring Devil-Slayer#1 - BTS) - Lt. Buckler warned Danny Sylva to watch his back around Bloodstone because they were mercenaries answering to anyone. Magi Kaufmann set the military on the trail of Bloodstone by giving them an anonymous tip about the whereabouts of William Wahl, which led Danny Sylva's Quick Reaction Force to an abandoned slaughterhouse. The Q.R.F. were surprised to see Bloodstone's vehicles in front of the slaughterhouse and thought they got the same tip. (Dead of Night featuring Devil-Slayer#1) - On their way into the slaughterhouse all but one member of the Q.R.F. were killed by shooters from the rafters. Sylva survived and kicked in a door to escape the shooters, but he ended up in a room filled with demons feasting on humans and Bloodstone members, including their leader, who was standing in front of Wahl hanging from the ceiling on a hook. Wahl's throat was cut by Bloodstone's leader and a blood pentagram was seen beneath the dead soldier. (Dead of Night featuring Devil-Slayer#2) - Sylva ordered Bloodstone to get on their knees and when they didn't follow his order he opened fire on them. The Bloodstone mercenaries easily survived the gunfire due to their demonic nature. They opened fire on Sylva after regenerating from their wounds. Sylva retreated to his vehicle, picked up an MK19-3 and blew up the demons with grenades. Bloodstone's leader Belathauzer survived and kept going after Sylva until Kaufmann aided Sylva in his escape. (Dead of Night featuring Devil-Slayer#2 - BTS) - Bloodstone framed Sylva for killing the soldiers. Kaufmann assured Sylva Bloodstone would cover up all the evidence for their sacrifices by letting the building burn down or destroying it with an air strike. Back at his place Kaufmann revealed the demons' plan to cause Armageddon. Kaufmann soon died of wounds inflicted upon him by Belathauzer in the slaughterhouse. (Dead of Night featuring Devil-Slayer#3) - Searching for Danny Sylva Bloodstone kicked in Gabir's door, but Sylva had already escaped through a secret passage in the basement. Gabir used a magic spell to blow up the building and kill the demonic Bloodstone members before one of them could go down into the basement. That night in Al-Qurna Bloodstone and demons were guarding Belathauzer during a meeting with archangel Gabriel. They were observed by Danny Sylva from afar until he was picked up by one of the demons and dropped right before Belathauzer and Gabriel, which was exactly what they had planned for because they needed the Sword of Naram-Sin. (Dead of Night featuring Devil-Slayer#4) - Bloodstone guarded Gabriel during the Xenogenesis ritual while Sylva fought and killed Belathauzer. Sylva ended up slaying numerous demons and Gabriel to prevent Xenogenesis. Lt. Buckler was apparently the highest ranked officer at the Q.R.F. barracks inside the Green Zone in Iraq. (Dead of Night featuring Devil-Slayer#1 (fb) - BTS) - Buckler looked into Sylva's four months away from Iraq and found out about his legal problems including public drunkenness, disorderly conduct and aggravated assault. 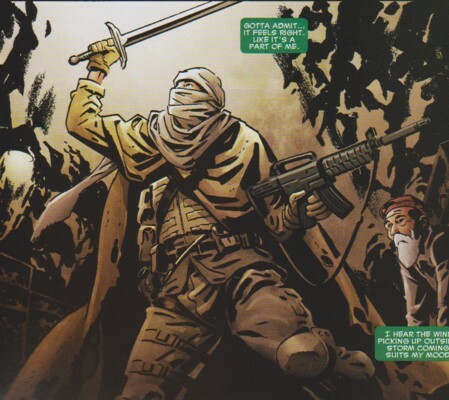 (Dead of Night featuring Devil-Slayer#1) - Buckler had a talk with Danny Sylva when he returned for his third tour in Iraq. He was surprised by Sylva's return because he never struck him as a lifer in the military. He revealed he had looked into his four months as a civilian and considered his legal problems back home concerning and told him how lucky he was he got away with a fine. He wanted to know what had happened, but Sylva only talked about how everything was about the election and economy now and nobody cared about really supporting the troops anymore. Buckler urged Sylva to concentrate on the lives of his fellow soldiers because they were what they were fighting for. He then explained how things had changed since Sylva's last tour because even though more soldiers were sent to Iraq there were also more private contractors. Speaking about the mercenaries Bloodstone he warned Sylva not to mess with them because they were seemingly not answering to anyone. (Dead of Night featuring Devil-Slayer#3) - Sylva called Buckler on a disposable cellphone. Buckler was angry at him for the slaughterhouse incident, but Sylva insisted he was set up by Bloodstone and didn't murder any of his fellow soldiers. Buckler revealed that even if Sylva was telling the truth he couldn't do anything to help Sylva because the massacre was on every news channel and their superiors including the Department of Defense, joint chiefs and probably even people in higher positions wanted Sylva brought in. Sylva hung up on Buckler. (Dead of Night featuring Devil-Slayer#4) - After Sylva's surrender ended in a shootout Buckler lost faith in his former friend's claims about being innocent. Buckler briefed soldiers on Sylva, who was now believed to be an enemy combatant. Devil-Slayer (Payne) was presumably the aged Earth-85133 counterpart to Devil-Slayer (Eric Simon Payne). He presumably wielded the Sword of Naram-Sin and wore the Shemagh during his time as Devil-Slayer. (Dead of Night featuring Devil-Slayer#2 (fb) - BTS) - Payne was the uncle of Danny Sylva's mother. At some point he became the Devil-Slayer. He allegedly went insane before Danny was born due to post-traumatic stress disorder from Vietnam. (Dead of Night featuring Devil-Slayer#3 (fb) ) - In reality he was unable to handle the strain of being Devil-Slayer. Years ago he went rogue and slew one of his generation's three Magi. His fate after going rogue stays unrevealed. Gabir was an Iraqi magic user, who had served Isaac Kaufmann as assistant. (Dead of Night featuring Devil-Slayer#2 (fb) - BTS) - Over the years Gabir learned to speak English, French and German. (Dead of Night featuring Devil-Slayer#3 (fb) - BTS) - At some point he became the assistant of Magi Isaac Kaufmann because he wanted to change the future for his children and grandchildren. During his time as Isaac's apprentice he learned a bit of magic himself. (Dead of Night featuring Devil-Slayer#2) - Gabir asked Danny Sylva and Isaac to come inside after they ran afoul Bloodstone and their leader Belathauzer. He took care of the wounded Isaac and told him to rest, but Isaac knew it was too late and asked Gabir to show Danny everything he needed to know and bring him to the Sword of Naram-Sin. Gabir was saddened by Isaac's passing, but followed his instructions. He took Danny by car to a cave protected by wards of protection, which would kill anyone but a Devil-Slayer, a Magi or their servants. He led Danny into the cave where they found the Sword of Naram-Sin and the Shemagh, the Devil-Slayer's uniform. After Danny put on his garb they left the cave and Gabir revealed he knew Danny was the Devil-Slayer as soon as he had passed the protective wards, which would've killed Danny if he were not the Devil-Slayer. Outside they were surprised by ghouls rising from the ground. It was a trap set up by Belathauzer. 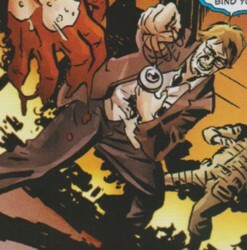 (Dead of Night featuring Devil-Slayer#3) - After correcting Sylva on the terminology of their opponents (ghouls not zombies) Gabir was jumped and pushed to the ground by one of the ghouls while Sylva shot and sliced his way through the ghouls. He slew the ghoul trying to eat Gabir last by stabbing it through the head. Gabir was glad the ghoul biting Sylva couldn't get through Sylva's boot and explained how the ghouls would turn to dust as soon as the sun rose. Taking Gabir's car back to his home they arrived home before 7 AM. Gabir made same tea and revealed why he had started to serve Isaac and how each generation had three Magi and one Devil-Slayer, but now all the Magi were dead. They had been slain by Belathauzer and Sylva's great-uncle, the previous Devil-Slayer, who had turned bad. Gabir suddenly heard a noise and saw the Bloodstone mercenaries arrive. He told Sylva to leave before Bloodstone could kill him because Sylva was the only one who could stop Operation: Xenogenesis. He promised to delay Bloodstone long enough for Sylva to escape with a few tricks he had learned from Isaac. He pretended he still needed to attend to Isaac's body because it couldn't fall into their enemy's hands, then gave Sylva Isaac's hard drive with all the information he needed in the future. He told Sylva about a passage in the basement hidden behind a panel in the far wall, which would bring Sylva behind Bloodstone's roadblock. When Sylva was gone Gabir sat down, drank some tea and waited for Bloodstone to kick in his door. When they did he summoned the fires of the Djinn (invoking the likes of Satannish, Thog, Kurios, Avarrish and Fashima) to blow up his home, slaying the mercenaries and himself in the process. Gabriel was an archangel gone rogue with vast mystical powers. (Dead of Night featuring Devil-Slayer#2 (fb) - BTS) - Gabriel was part of a cadre of angels and demons, who worked behind the backs of God and Satan on manufacturing a war between Heaven and Hell and cause an early apocalypse. Their first step was to start Xenogenesis, the rebirth of the demon race on Earth. (Dead of Night featuring Devil-Slayer#3 (fb) - BTS) - Gabriel was detained when he tried to leave Heaven. 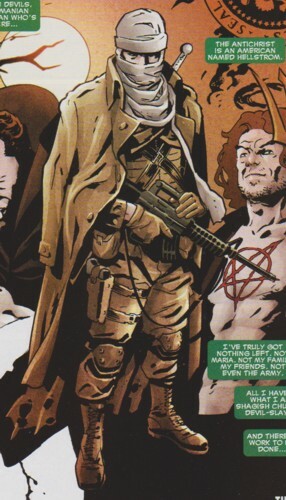 (Dead of Night featuring Devil-Slayer#3) - Gabriel arrived late in Al-Qurna, Iraq for his meeting with Belathauzer. He chose Al-Qurna for sentimental reasons because it was allegedly the site of the Garden of Eden. Gabriel didn't want Belathauzer to compare himself to him because he was not a fallen angel like Belathauzer and only tried to start Armageddon because he was sure Heaven would win the upcoming war against Hell. He promised Belathauzer and the other fallen angels a place in Heaven afterward. When Belathauzer revealed he had slain the last Magi to prevent him from finishing the Devil-Slayer's training, which angered Gabriel, who was afraid the Devil-Slayer could've already finished his training and wanted to be consulted for such actions. Belathauzer assured him everything was going according to plan and moments later a demon dropped Devil-Slayer, the only man that could kill them, in front of Gabriel and Belathauzer with the Sword of Naram-Sin, which they needed and couldn't retrieve themselves. (Dead of Night featuring Devil-Slayer#4) - Belathauzer introduced Gabriel to Danny Sylva, the last Devil-Slayer. Gabriel reminded Belathauzer they didn't have time to play with Sylva, but Belathauzer didn't agree. Gabriel started the Xenogenesis ritual to open the portal to Hell while Belathauzer got into a fight with Devil-Slayer. Gabriel ordered other demons to protect him during the final ritual. Devil-Slayer slew Belathauzer then went up some stairs to confront Gabriel, who cowardly told Devil-Slayer he couldn't slay him because he was no Devil, but Sylva didn't care and decapitated Gabriel, whose body dropped into the open portal beneath them. The portal closed right behind Gabriel. Isaac Kaufmann was one of this generation's three Magi. He used mystical talismans and possessed magical powers. He had collected information on supernatural threats for years and possessed the knowledge needed to train and aid this generation's Devil-Slayer against these threats. (Dead of Night featuring Devil-Slayer#2 (fb) - BTS) - Isaac Kaufmann was one of the three Magi of his generation that acted as spiritual advisers to the Devil-Slayer. Learning about Danny Sylva from Danny's great-uncle Payne, the previous Devil-Slayer, he kept tabs on Danny and safeguarded him. (Dead of Night featuring Devil-Slayer#1) - Isaac Kaufmann arrived with the same Sunair plane in Iraq as Danny Sylva. He actually sat only two seats away from him and talked to Danny's future colleague Miles Ochse during the flight. He worked on his laptop during the flight. When the plane had landed Danny overheard Isaac telling Miles that he was a reporter for the Bugle. He was picked up by a driver at the airport and taken to a compound. That night he called the Q.R.F and gave them an anonymous tip about the whereabouts of missing soldier William Wahl that led Sylva's unit to an abandoned slaughterhouse. 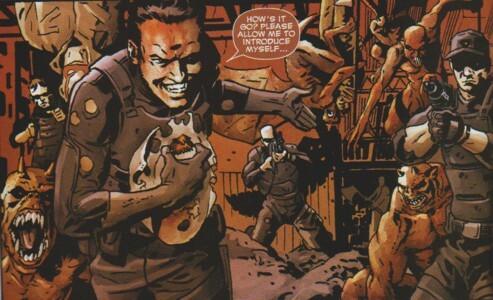 (Dead of Night featuring Devil-Slayer#2) - Isaac came to Danny's aid when Belathauzer attempted to kill Danny at the slaughterhouse. The demon was surprised to see a Magi because he thought they had killed them all in Gaza the year before. Belathauzer ripped open Isaac's belly, but the Magi still managed to use a binding spell (invoking Satannish and Cytorrak) to trap Belathauzer. He demanded Danny to come with him and leave behind the other soldiers to get the chance to avenge them. Isaac fled with Danny, who got Isaac to his car and then drove him back home. During the ride Danny pulled his gun on Isaac and demanded answers. To Danny's surprise Isaac knew his name. Isaac promised he was there to help Danny, which he indirectly did when Isaac's radio, which was monitoring secure channels, revealed to Danny that Bloodstone blamed Sylva for the murders at the slaughterhouse. At Isaac's home his assistant Gabir tried to patch him up while Isaac told Danny what they were up against, an army of rogue demons and angels, who wanted to bring on Armageddon early by manufacturing a war between Heaven and Hell. The demons were led by Belathauzer, who could only be killed by the Sword of Naram-Sin and planned to start Xenogenesis, the rebirth of the demon race on Earth. According to Isaac they were close to succeeding. After telling Sylva that Danny was this generation's Devil-Slayer and that his great-uncle was the previous one. Isaac told Danny he had been safeguarding him, but Danny thought he had done a poor job. Danny still saw an opportunity to get revenge. Isaac died after telling Danny that Gabir would show him where to find the Sword of Naram-Sin. 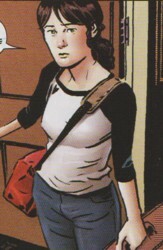 (Dead of Night featuring Devil-Slayer#1 (fb) - BTS) - Maria was in a relationship with Danny Sylva since High School. They eventually got engaged, but after his second tour in Iraq she left him. While Danny was in Iraq she met another man and started a relationship with him. (Dead of Night featuring Devil-Slayer#1 (fb) ) - With her suitcases packed she told Danny he wasn't the man anymore she had fallen in love with in High School. She then left their home. (Dead of Night featuring Devil-Slayer#1 - BTS) - Even though she had left him Danny still had a photograph of her with him when he returned to Iraq for his third tour. The Sword of Naram-Sin was the mystic blade wielded by the Devil-Slayer to slay demons. The weapon's origin is unknown. (Dead of Night featuring Devil-Slayer#2 - BTS) - Isaac Kaufmann told Danny Sylva about the Sword of Naram-Sin, the only weapon capable of killing the demon Belathauzer. (Dead of Night featuring Devil-Slayer#2) - Gabir brought Sylva to the cave were the sword and the Devil-Slayer's uniform Shemagh were stored. Sylva put on the garb and left the cave wielding the sword and an automatic rifle. (Dead of Night featuring Devil-Slayer#3) - Sylva sheathed the sword while shooting a horde of attacking ghouls. He eventually pulled the sword as his second weapon and cut through the ghouls with bullets and the sword at the same time. He slew the last ghoul with the sword by stabbing it through the head and at the same time saved Gabir from it. Sylva sheathed the sword and took it to Gabir's home. He too it with him to Al-Qurna when the Bloodstone mercenaries attacked Gabir's home. At night he dropped it in Al-Qurna when a demon dropped him from the sky in front of Belathauzer and the archangel Gabriel. 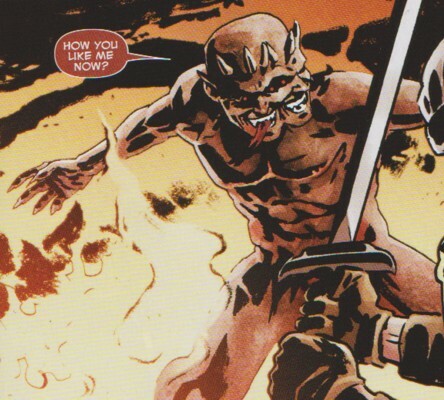 (Dead of Night featuring Devil-Slayer#4) - Before Sylva could grab his sword again Belathauzer picked him up by the throat. Sylva broke free, picked up the sword and after a lengthy fight dropped it again. He then used his automatic rifle to shoot Belathauzer to pieces and picked up the sword again while the demon regenerated his body. When Belathauzer leapt at Sylva he used the sword to decapitate him. He then cut his way through a few more attacking demons and ultimately decapitated Gabriel as well to stop him from finishing the Xenogenesis ritual. Sylva, the new Devil-Slayer, stayed in possession of the Sword of Naram-Sin, but didn't use it against soldiers at the Q.R.F. headquarters when they tried to shoot him. Though he is ready to use it against future threats of demonic and monstrous nature.